The Place Replacing the now defunct The Factory, this new cafe in the Serangoon / Kovan area deserves much positive appraisal. It was what The Factory was not. Sunday Market up the ante by introducing more interesting fusion of daily favourites onto our plates. Their placement of quirky furnitures from neighbouring shops in contrast with its industrial theme restaurant setting, provides a vision feast out our eyes! And to all drivers, the availability of carpark spaces along Lim Tua Tow road is such a blessing to this Sunday Market! The Food Expect our usual daily treats at Sunday Market, but served with an unexpected twist! Fusing together menu typically served separately seemed a key concept here. 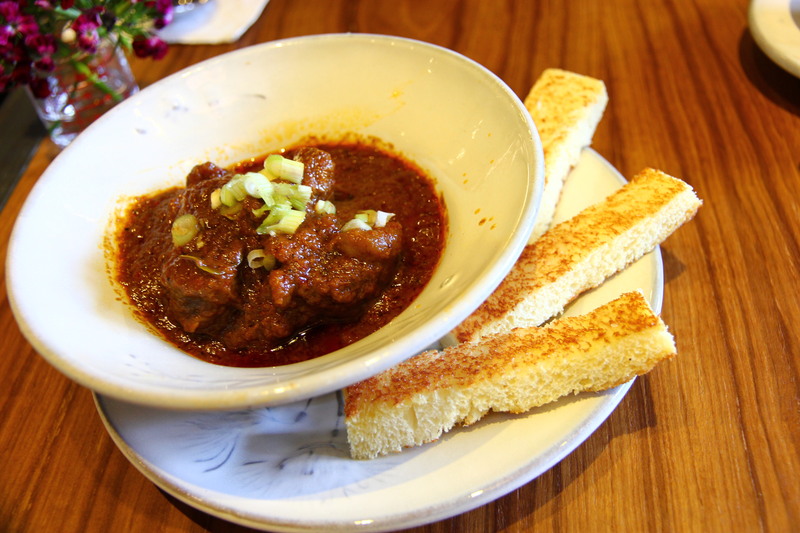 The Sirloin Rendang Toast ($15.90) cleverly matched our local rendang paste with well better beef (i.e. Sirloin). This, together with Singapore-styled Toast, makes a good mains while at the Market. We all love Bangkok. But with the political instability in the country, how able enjoying the best from Thailand here?! The Bangkok Toast ($10.90) seemed inspired by the popular After You dessert cafe in Bangkok, matching a sweet toast, together with green tea puree and accompanied by Thai Iced Tea ice cream – totally heavenly! This is a must-try with you are here! Just complete the meal with any of the wide selection of coffee and tea here. Though I must add that the Cafe Latte ($5.00) at Sunday Market did perk my Sunday up well. Rants Still new, and therefore expect teething issue like forgotten orders and messy service (i.e. omitting our Sirloin Rendang order & serving our Bangkok Toast with no cutleries). That said, do expect sincere service. Will I return again? With the lack of good cafes in the North East and ample parking space at Sunday Market, definitely a yes. But with keen competition mushrooming in the area, Sunday Market really need to keep its standards up and not become another Factory – whose food was rather dismal despite its initial positive reviews. Make your reservation at Sunday Market instantly here.